If you're a child of the 80s or 90s, it's likely that you spent some of your adolescence hanging out at your local mall, and may even associate many of your formative experiences with the place: maybe you got your ears pierced at Claire's, bought your first CDs from Sam Goody, served slushies at an Orange Julius, blew your first paycheck on Hollister hoodies, went through a Hot Topic phase (it's okay, the best among us did). The mall was not just a place for shopping and eating, but served as a crash course to capitalism and a site for trying out social behaviors. But shifting consumer attitudes toward online shopping and the ever-expanding conveniences offered by online retailers (subscription shopping, overnight delivery, flash sales, etc.) have changed mall culture for good. 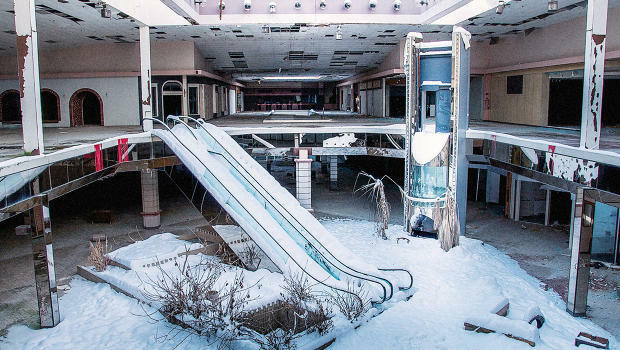 In Nobody Shops Here Anymore: Essays on the Disappearing American Mall, edited by Tobias Carroll and Jason Diamond, twenty-five-plus writers explore their nostalgia for the American mall and what its decreasing relevancy implies about the way we consume goods and culture. Look for it in fall 2017! Contributors include Porochista Khakpour, Maris Kreizman, Lindsay Hunter, and Danielle Henderson. Tobias Carroll writes fiction and nonfiction. He's the managing editor of Vol.1 Brooklyn, and his work has recently appeared in Tin House, Midnight Breakfast, The Collapsar, The Collagist, Joyland, Necessary Fiction, and Underwater New York. He is the author of the story collection TRANSITORY. He lives in Brooklyn. Jason Diamond is a former associate editor at Men's Journal and currently the sports editor at Rolling Stone. He has written for the New York Times, The Paris Review, The Wall Street Journal, New Republic, Vice, Bookforum, Tablet, The Awl, Pitchfork, McSweeny's, NPR, The Rumpus, and many other fine outlets. His memoir Searching For John Hughes will be released in November 2016.